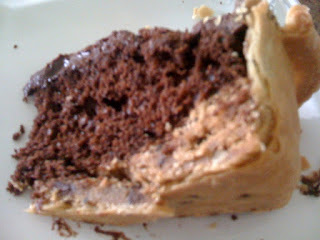 I believe I used all Pillsbury products for my version of Chocolate Cookie Cake Pie. This was the easiest dessert I've ever made. I baked it at 350 degrees for about 45 minutes. Let cool, then frost. I put 1 teaspoon of cinnamon in the frosting before spreading it on the cake. It is really good -and a little bit goes a long way. The flaky pie crust really helps cut the sweetness of the cookie dough. The basil, thyme, and cilantro have teeny tiny leaves. 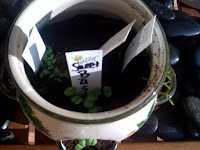 Am I growing "micro" herbs ? 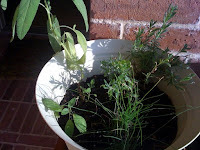 This is sage, lavender and chives. So far so good. 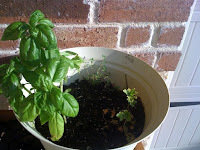 This is the basil, thyme, and italian parsley. The italian parsley is barely holding on. 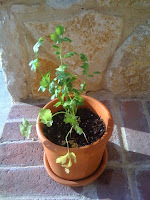 Here is my cilantro. Still alive, but we do have one dead limb.